Kacey's passion for helping others facing limb-threatening conditions began when she nearly lost her arm due to a close range gunshot wound at Columbine High School in April of 1999. Kacey Johnson is a strikingly beautiful mother of four and a volunteer for The Limb Preservation Foundation. Her passion for helping others facing limb-threatening situations began when she nearly lost her arm due to a close range gunshot wound during the Columbine High School shooting in April of 1999. This severe injury brought Kacey to Presbyterian/St. Luke’s Medical Center, where her care was overseen by orthopedic surgeon Dr. Ross Wilkins and plastic surgeon Dr. William Brown. With the use of an allograft, a bone from a donor, Drs. Wilkins and Brown were able to rebuild Kacey’s shoulder and save her arm. 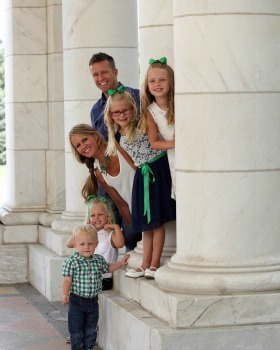 Since her unimaginable injury over 16 years ago, Kacey has created a joy-filled life with her husband, Patrick, and their four children: Mallory, Logan Jo, Bentley and Corban. Of the countless accomplishments she has achieved, which have included becoming an oncology nurse, a volunteer with The Foundation and an advocate for both Donor Alliance and AlloSource, Kacey considers her greatest accomplishment to be “parenting with her disability”. Her family is in the forefront of her life, and she raises her children with an appreciation for serving others and an acceptance of people with different physical abilities. Kacey believes that difficult experiences can be used to better lives and that we all have the power of positivity in overcoming any weakness. We all have the ability to thrive! The Foundation is lucky to call Kacey a friend, volunteer and patient advocate, and is proud to have funded research that helped to save her limb. Riley knows without a doubt who the cutest dog in the room is, and it is he! 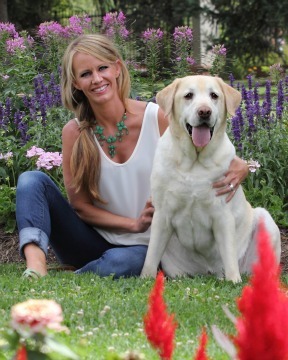 This eight-year-old Yellow Lab has not slowed down in the slightest since his diagnosis of osteosarcoma of his jaw in February of 2015. After his mom found a bump in his mouth, Riley quickly began chemotherapy and underwent surgery to remove the front part of his lower jaw between his two canine teeth. The surgery not only resulted in Riley’s cancer being removed, but he now has the adorable side effect of always having his pink tongue hanging out! Described as a ‘galump’ by his parents, Riley continues to love eating, snuggling and playing with his brother, Duke!